Partington's Holiday Centres is committed to protecting your privacy and security. This policy explains how and why we use your personal data and to ensure you remain informed and in control of your information. Any questions you have in relation to this policy or how we use your personal data should be sent to GDPR@partingtons.com or addressed to GDPR Officer, Partington's Holiday Centres, Chapel Court, 204 Fleetwood Road North, Thornton-Cleveleys, FY5 4BJ. Your personal data (i.e. any information which identifies you, or which can be identified as relating to you personally) will be collected and used by Partington's Holiday Centres. For the purposes of data protection law, Partington's Holiday Centres will be the data controller. If you purchase a Partington's Holiday Centres gift card for someone, holiday maker, tourer or caravan owner, your details will be recorded (as will the recipients) and your relationship to that person will be recorded. Information created by your involvement with Partington's Holiday Centres will result in personal data being created. We conduct research and analysis on the information we hold, which can in turn generate personal data. For example, by analysing your interests and involvement we may be able to build a profile which helps us decide which of our communications are likely to interest you. We sometimes receive personal data about individuals from third parties. For example, if we are partnering with another organisation. Occasionally, we may collect information about certain customers (e.g. particularly well known or influential people) from public sources. This could include public databases (such as Companies House), news or other media. We don't do this to everyone, and it is the exception not the rule. We do not normally collect or store sensitive personal data (such as information relating to health, beliefs or political affiliation). However, there are some situations where this will occur. If this does occur, we will take extra care to ensure your privacy rights are protected. If an accident or incident occurs on our property, at one of our events or involving one of our staff then we will keep a record of this (which may include personal data and sensitive personal data). We use personal data to communicate with people and to promote Partington's Holiday Centres. This includes keeping you up to date with our news, updates, campaigns, club and bar information. We carry out research and analysis on our customers to determine the success of campaigns and appeals, better understand behaviour and responses and identify patterns and trends. This helps inform our approach towards campaigning and make Partington's Holiday Centres a stronger and more effective organisation. Understanding our customers, their interests and what they care about also helps us provide a better experience (e.g. through more relevant communications). We will never sell your personal data. If you have opted-in to marketing, we may contact you with information about our partners, or third-party products and services, but these communications will always come from Partington's Holiday Centres and are usually incorporated into our own marketing materials (e.g. advertisements in magazines or newsletters). Partington's Holiday Centres will inform all customers about GDPR and have an "opt-out" option for most communications. This means you will have the choice as to whether you want to receive these messages and be able to select the method of communication. You can decide not to receive communications or change how we contact you at any time. If you wish to do so please contact us by emailing GDPR@partingtons.com or writing to Partington's Holiday Centres, Chapel Court, 204 Fleetwood Road North, Thornton-Cleveleys, FY5 4BJ. When you receive a communication, we may collect information about you, respond to, or interact with that communication, and this may affect how we communicate with you in future. 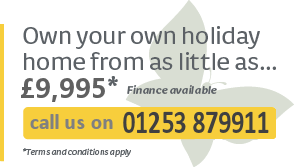 Partington's Holiday Centres operates a holiday home owners discount scheme. Only our home owners receive these discounts. We will collect information on purchases in order to provide you with a better service. We might use this information to contact you about similar products and services that may be of interest to you. This section explains how and why we use personal data to build profiles which enable us to understand our customers, improve our relationship with them, and provide a better customer experience. We analyse our customers to determine common characteristics and preferences. We do this by assessing various types of information including behaviour (e.g. previous responses) or demographic information (e.g. age or location). By grouping people together on the basis of common characteristics, we can ensure that group is provided with communications, products, and information which is most important to them. This helps prevent your inbox from filling up, and also means we aren't wasting resources on contacting people with information which isn't relevant to them. We profile customers in terms of financial and practical support. In some cases, we will obtain likely indicators of interest or financial status based on your postcode rather than at an individual level. This information will not be specific to you, but probable characteristics based on your postcode. We may aggregate and anonymise personal data so that it can no longer be linked to any particular person. This information can be used for a variety of purposes, such as recruiting new customers, or to identify trends or patterns within our existing customers. This information helps inform our actions and improve our campaigns, products/services and materials. We want young people to join in, and there are opportunities for customers to share their photos, stories and pictures. If we publish your child's picture, photo or story, we will usually include their first name and age with it. If your child enters a competition and is one of the lucky winners or runners-up, we will publish their name and winning entry alongside the other winners. Parental permission: If your child is under 18 then we will need permission from you as their parent or guardian for them to enter one of our competitions or to share a picture, photo or story with us. We take great care to protect and respect the rights of individuals in relation to their personal data, especially in the case of children. If your child is under 18, we will only use his or her personal data with your consent. This means that, for example, if your child wants to have his or her name or picture featured, we will need you to confirm you are happy for us to do so. We will not send marketing emails, letters, calls or messages to under 18-year-olds. All electronic Partington's Holiday Centres forms that request financial data will use the Secure Sockets Layer (SSL) and the latest encryption protocol as defined by PCI-DSS to encrypt the data between your browser and our servers. Some of our premises have CCTV and you may be recorded when you visit them. CCTV is there to help provide security and to protect both you and the Partington's Holiday Centres. CCTV will only be viewed when necessary (e.g. to detect or prevent crime) and footage is only stored temporarily. Unless it is flagged for review, CCTV footage will be overwritten. Partington's Holiday Centres complies with the Information Commissioner's Office CCTV Code of Practice, and we put up notices so you know when CCTV is in use. Partington's Holiday Centres operations are based in the UK and we store our data within the European Union. Some organisations which provide services to us may transfer personal data outside of the EEA, but we will only allow them to do if your data is adequately protected. We will only use and store information for so long as it is required for the purposes it was collected for. How long information will be stored for depends on the information in question and what it is being used for. For example, if you ask us not to send you marketing emails, we will stop storing your emails for marketing purposes (though we will keep a record of your preference not to be emailed). If you would like further information on your rights or wish to exercise them, please contact us by emailing GDPR@partingtons.com or writing to Partington's Holiday Centres, Chapel Court, 204 Fleetwood Road North, Thornton-Cleveleys, FY5 4BJ. Our website uses local storage (such as cookies) to provide you with the best possible experience and to allow you to make use of certain functionality. Further information can be found in our Cookies Policy. Our website could contain hyperlinks to other websites. We are not responsible for the content or functionality of any of those external websites (but please let us know if a link is not working by using the 'Contact us' link). When purchasing goods or services from any of the businesses that our site links to, you will be entering into a contract with them (agreeing to their terms and conditions) and not with Partington's Holiday Centres.